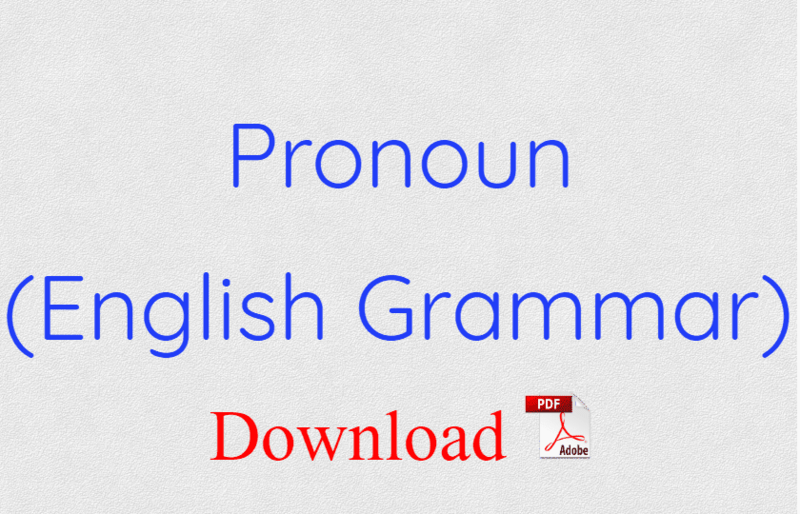 Pronoun - A Word that is used instead of a noun is called a pronoun . The pronouns I and We , which denote the person or persons speaking , are said to be personal pronouns of the first person . ( a ) I am going to school . ( b ) We are taking the examinations . ( c ) I am young . ( d ) We are students . The pronoun You , which denotes the person or persons spoken to , is said to be a personal pronouns of the second person . ( a ) which is your classroom ? ( b ) How are you ? ( a ) महात्मा गांधी हमारे राष्ट्रपिता हैं । Mahatma Gandhi is the father of our nation . The pronouns He, She , They and It , which denote the person or persons spoken of , are said to be personal pronouns of the third person . ( a ) She has prepared this chart . ( b ) Help her in her studies . ( c ) Here is your book ; take it away . ( d ) The horse fell and broke its leg . ( e ) The baby has torrm its clothes . I go to school . That car is mine . That cow is yours . ( a ) It is my car. This car is mine. ( b ) That is your bat . That bat is yours . ( c ) It is Our School . This school is ours . ( d ) That is her doll . That doll is hers . ( e ) These are their bags . These bags are theirs . ( f ) It is his garden . This garden is his . ( a ) He hurt / himself . ( b ) Take care of yourselves . ( c ) Ram loves himself . ( d ) Did she pay for herself ? ( e ) I harmed myself . ( f ) Look after yourselves . ( g ) The old man hanged himself . ( h ) It is not easy to amuse oneself on a holiday . ( i ) I cut myself . ( j ) I availed myself of casual leave . ( k ) The boys hid themselves . ( l ) Ram befooled himself . ( m ) Ram and Shyam blamed themselves for the accident . ( a ) The king himself gave her the medal . ( b ) Ram himself went there . ( c ) We ourselves cooked the food . ( d ) I myself prepared this report . ( a ) This is my watch . ( b ) The Se are our books . ( a ) That is a plant . ( b ) Those are the new ones . ( a ) This is my pen . This pen is mine . ( b ) That is your book . That book is yours . ( a ) Who wrote this letter ? ( b ) Whose is this pen ? ( c ) Whom do you hate ? ( d ) Who is knocking at the door ? ( a ) What does he want ? ( b ) What will you have to drink ? ( a ) Which is your pen ? ( b ) Which of those men is your father ? ( a ) Which is your book ? Which book is yours ? ( b ) Whose is this pen ? Whose pen is this ? ( a ) Somebody has stolen my watch . ( b ) All were drowned , many of them were Indians . ( c ) One should do one’s duty . ( d ) One should mind one’s own business . ( a ) Take either of these two mangoes . ( b ) Neither of the two sisters came here . ( c ) Neither of the two passed . ( d ) Either of the girls is slim and tall . ( a ) Each of you can go home . ( b ) Each of them is to blame . ( a ) None of them can do it . ( b ) Any of these four girls may dance . ( a ) Neither of the statements is true . Neither statement is true . ( b ) Each of the boys gets a prize . Each boy gets a prize . 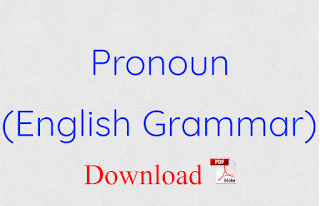 A pronoun which shows relation of a noun is known as relative pronoun. ( a ) I know the man who came here yesterday . ( b ) I met Ram who had just returned . ( c ) Here is the book that you lent me . ( d ) I have found the pen which I lost . ( a ) Whom the God loves die young . ( b ) Where are the boys I called ? ( a ) I know the boy who has stolen your purse . ( b ) Tell me the name of the girl who you want to see . ( a ) The two brothers loved each other . ( b ) Russia and America are jealous of each other. ( a ) The five boys helped one another . ( b ) They all gave gifts to one another . ( a ) What a foolish man he is ! ( b ) What you lost the purse ! ( a ) You , he and I shall go to Delhi . ( b ) You , he and I shall play football in the morning . ( a ) I , he and you can never live together . ( b ) I and you are ruined forever . ( c ) I and he stole Ram's book . ( a ) You , he and I are doing Our duties well . ( b ) He and I have done our work . ( a ) You and he are doing your duties well . ( b ) You and they have finished your home - Work . ( a ) The army killed its commander . ( b ) The committee has published its reports . ( a ) Sita and Gita attended their monthly meeting . ( b ) Ram and Shyam blamed themselves for the accident . ( a ) The Doctor and Author has written his book . ( b ) The Principal and Secretary has tendered his resignation . ( a ) Everyone should do his duty . ( b ) None should hate his neighbour . ( a ) Neither Sita nor Gita has done her duty . ( b ) Either Ram or Shyam has Sold his books . ( a ) It is I who am to blame . ( b ) It is I , your friend , be not afraid . ( a ) Let you and me go . ( b ) Let her and me do it . ( c ) Let him go there . ( d ) Let us go out for a walk . ( a ) This is between you and me . ( b ) It is between her and me . ( c ) There is conflict between you and me . ( d ) There is similarity between you and him. ( a ) He depends on me . ( b ) You should act upon his advice .